Information from REWAS 2016 proceedings were collected and published in REWAS 2016: Towards Materials Resource Sustainability. This collection covers the proceedings of the symposium sponsored by the Recycling and Environmental Technologies Committee; the Materials and Society Committee; the Extracting & Processing Division; and the Light Metals Division of the Minerals, Metals and Materials Society. Topics covered include: enabling and understanding the sustainability related to ferrous and non-ferrous metals processing; batteries; rare earth element applications; and building materials. At REWAS 2016, materials professionals exchanged ideas with other researchers and stakeholders to outline a path toward a resource-efficient society. Randolph E. Kirchain is the editor of REWAS 2016: Towards Materials Resource Sustainability, published by Wiley. 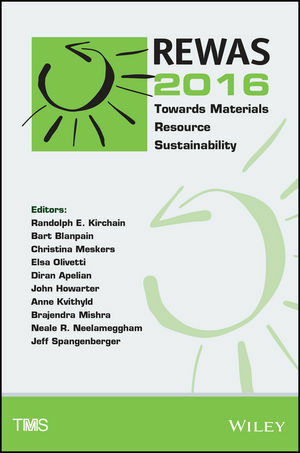 Bart Blanpain is the editor of REWAS 2016: Towards Materials Resource Sustainability, published by Wiley.